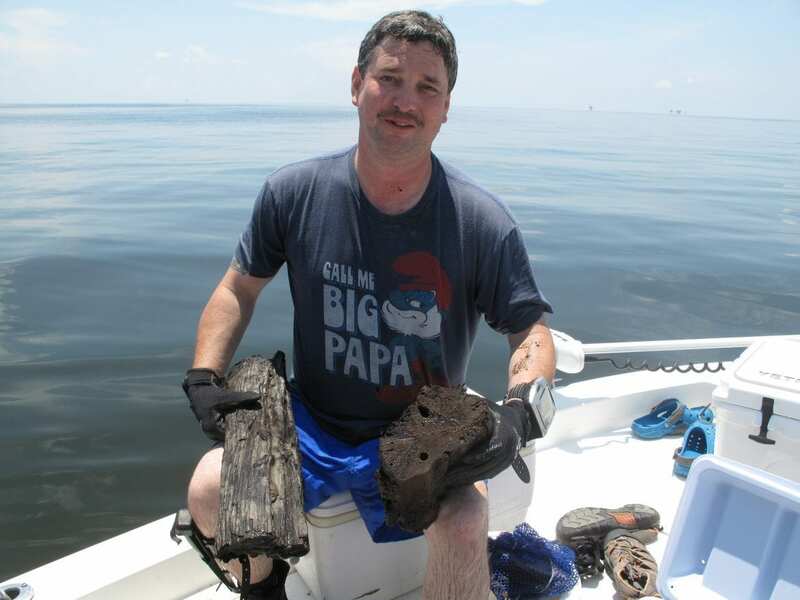 About 10 miles off the Alabama coast, Ben Raines falls gently backwards from a boat into the Gulf of Mexico, a scuba tank strapped to his back and handsaw on his belt. He’s on a mission to collect cypress samples from 60-feet below. “We’re going to cut some pieces as if we were in a forest on land,” says Raines, an environmental reporter with AL.com. “It’s just a forest transplanted to the bottom of the ocean,” Raines says. Scientists say it’s a remarkable discovery. “The underwater forest is like the Garden of Eden underwater,” says Christine DeLong, a paleo-climatologist at Louisiana State University. She says tests date the forest to be between 50,000 and 70,000 years old. DeLong says they’re looking at pollen, seeds and insects found in sediment cores taken from the site. And they’re learning what happens during periods of climate change. Marine scientist Brian Jones is also on this dive, and comes up with fish in his net. He’s collecting specimens to include in a display about the underwater forest at the Dauphin Island Sea Lab on the Alabama coast. His net yields a belted sandfish, a band tail puffer and an arrow crab, a creature that looks more a praying mantis than a crustacean. Jones also brought up sponges and anemones that had burrowed into the old wood. He says the northern Gulf floor for the most part is flat and sandy, so finding an area like this with the kind of sea life you might find on a coral reef is a treat – one that he will try to recreate in an aquarium. Ben Raines has produced a documentary about the underwater forest, and is working to have the site declared a national marine sanctuary.